I am very happy to be linking up with Kim at Finding Joy in the 6th Grade for her linky! I am just about to start Grade 3 Testing - the time when I have to take down or cover up bulletin boards and anchor charts and not help my class with their work, so this is usually the time I look around and think about what I want to do differently next year and what I want to try. This linky is perfect timing for where I am at mentally right now! I purchased the Interactive Math Journals from Runde's Room this year but haven't started using it yet. I plan on reading through it this summer, planning out how I want to use it and trying to make a few sample pages myself. I would like to try more "notebooking" in general and have created a pin board just on this topic - but my goal for next year is just math! I think I have done a decent job this year of co-creating anchor charts with my students. I like to use a combo of these anchor charts and mini-posters I make to create a resource wall for students to refer to. 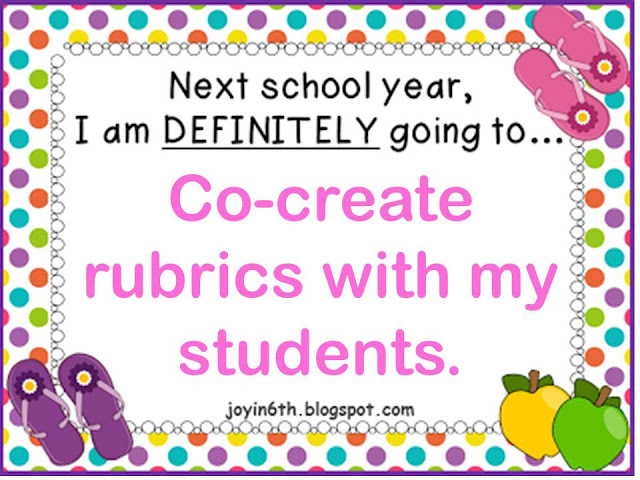 I read this post by Joanne at Head Over Heels for Teaching and thought - I definitely want to do that next year! This was my first year back in a Grade3/4 after being in a Grade 2/3 and I think I dropped the ball on novel studies and book talks. I really want to get a better handle on this over the summer and have already found some excellent blog posts and resources to help me along. I also bought many, many reading comprehension fans to help guide our talks! I have been inspired by Amanda at Collaboration Cuties and Jivey at Ideas by Jivey to start using mentor sentences next year. I even purchased Jivey's 10 week unit on using mentor sentences to get me started. 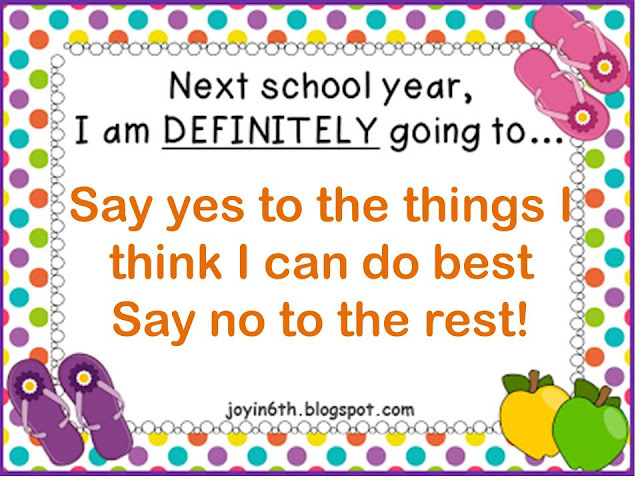 I often find myself taking on more than I want to at school and becoming frustrated by not being able to do my best or feeling rushed because I have said yes (or just not said no) to too many things. I would like to focus on what I really want to do and give those few things my all and say no thank you to the rest. I love this linky already - it is great to see other people's goals for next year. I feel like we are all still learning and growing (even the bloggers I think have it all together) ! Be sure to link up - I would love to read about your goals!! 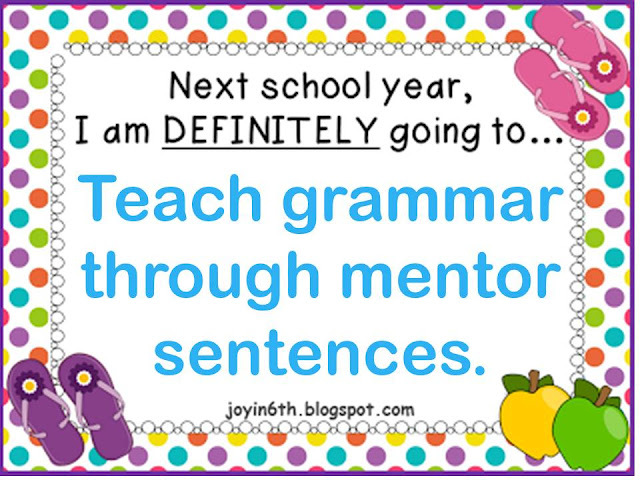 I've never heard of mentor sentences...thanks so much for posting about them! I love that idea. I completely agree about focusing on what you do best - and letting other things go. I often over-extend myself and then get frazzled. 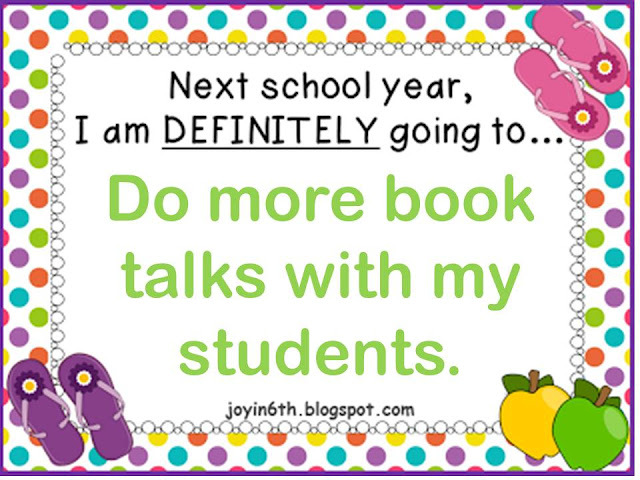 I also want to do more book talks. I used to do a lot of them about 5-6 years ago and it really made a difference to the excitement around reading in my class. Sounds like you have some great goals! I love using notebooks with my students. I bet you will too. I completely agree with you about learning to stay "no." It is so easy to end up taking on too much. That is something I need to work on too. I'm joining the mentor sentences bandwagon too!! I'm looking forward to hearing how it goes for everyone. Love the link of teaching grammar using mentor sentences. 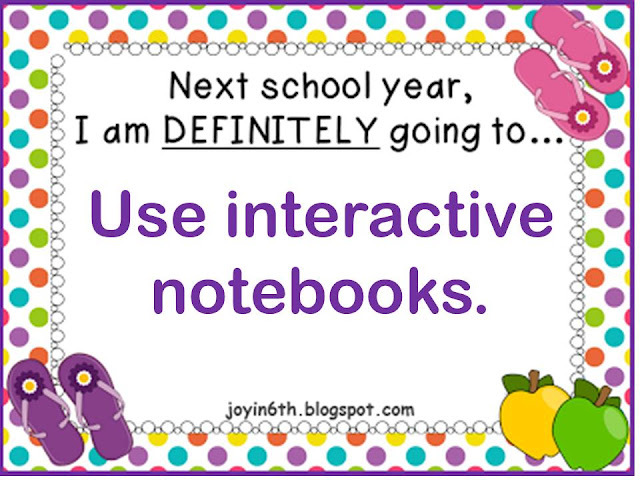 What a great way to keep students engaged! I also like to find real world grammar mistakes to display and have the students find the error.